Our New Column in Trailer Life Magazine – Roads to Adventure! We are very excited to announce that we are going to be writing and providing photos for a regular column in Trailer Life Magazine! Our column debuts in the January issue of Trailer Life Magazine. For many years, the back page of Trailer Life has featured the unique stories and insights of RVer and writer Bill Graves. Bill’s unusual tales from the less traveled roads of America have been such a delight to readers that we’ve heard people say that the first thing they do with Trailer Life is to flip it over and read Bill’s column on the back page. I admit that I have done the same thing! 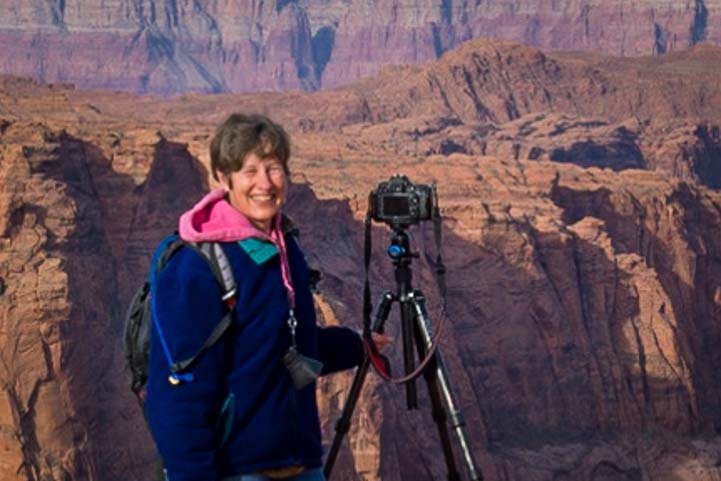 Bill has decided to retire from writing his column, and Trailer Life has asked us and travel writer Lisa Densmore Ballard to take turns luring readers to the back page. We are thrilled to have been given this honor. Trailer Life has named the new column “Roads to Adventure,” and we’ve come up with a new and different format for the column that will highlight our love of photography. Each column will feature a beautiful photograph from a special place we’ve seen in our travels and will include a brief description of our experiences there. Our “Roads to Adventure” columns will bring you a stunning photo from an enchanting place. We will be writing this column every other month beginning with the January, 2017, issue. 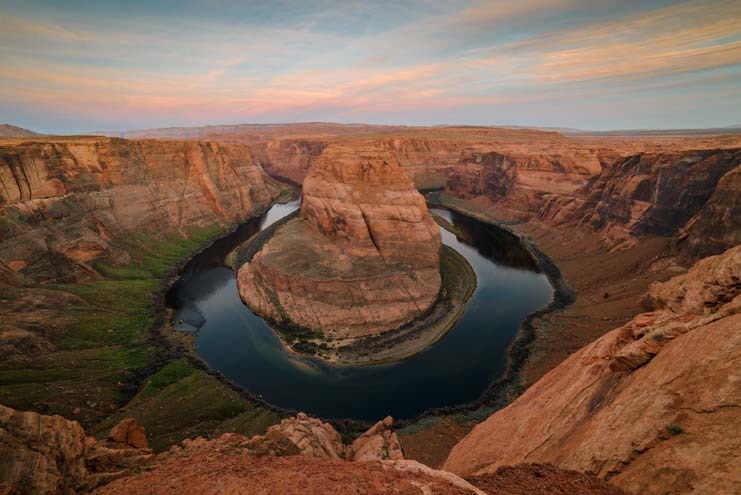 Our first column is about the wonderful sweeping bend in the Colorado River that RVers can see when they make a trek to Horseshoe Bend, Arizona. 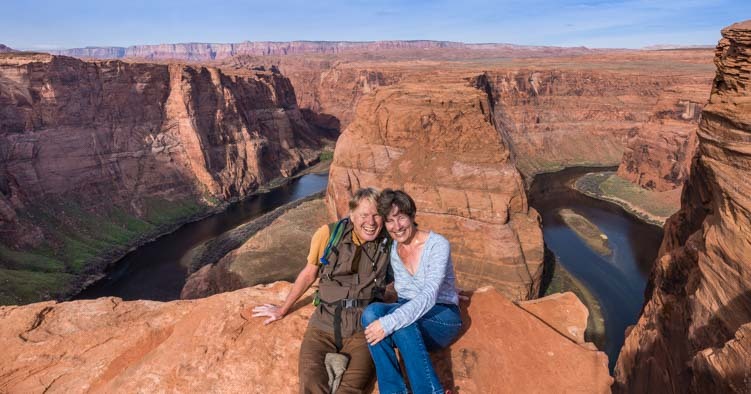 Horseshoe Bend is a fantastic place for RVers to do a little photography. 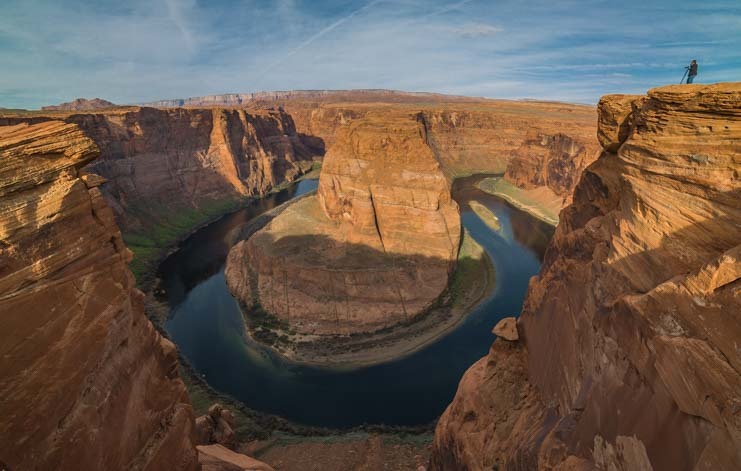 Horseshoe Bend Overlook in Arizona – Stunning! We were utterly smitten when we visited, both by the immense size and scale of the cliffs and by the crazy antics tourists did on out on the hairy edge. We took endless photos, and one of Mark’s finest is the one that Trailer Life chose for our debut column. Sunset was a wild time at Horseshoe Bend with hoards of people taking selfies and photographers lining up at the edge, tripod to tripod, watching the sun slip away on the horizon. Sunrise, however, was peaceful and still and hauntingly beautiful. Even though the sun rose at our backs, it was a thrill to watch the shadows disappear down the rock walls under the pink sky in front of us as it climbed higher and higher in the sky. Although famous for its sunsets, our favorite moments at Horseshoe Bend were at sunrise! 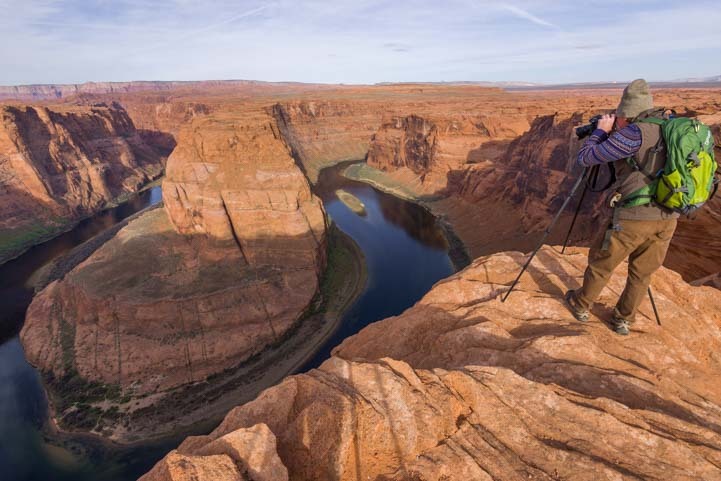 We captured many wonderful images at Horseshoe Bend, and one of Mark’s just won the Photo of the Day at Steve’s Digicams a few days ago. This is the fifth photo of his that has been featured on that website. Horseshoe Bend, Arizona – What a place! 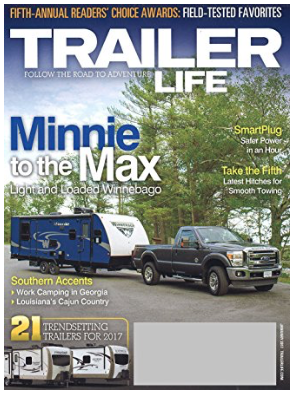 Both for seasoned RVers and for those that are new to the hobby, Trailer Life is an informative magazine that offers lots of RV tech tips, overviews of major RV upgrade projects as well as enticing travel destination features. We have lots more fun destinations in store for Trailer Life readers from the many places we’ve visited over the years, and we hope that our spot on the back page will be one that readers turn to. Look for us on the back page of Trailer Life Magazine! Congratulations!!! Another great reason to look forward to receiving my Trailer Life. I love opening up my email and see another “Roads Less Traveled” article. I wish you the best in this new adventure. Congrats on the new project! I will have to check out the magazine. Congrats! Looking forward to your contributions in Trailer Life. Great to see all your success. It’s well deserved. And thanks for all your hard work and dedication while sharing your adventures with us over the years. We love having loyal readers like you, Lew. It goes both ways!! Way to go you Two Marvelous people. Sooo very proud your hard enjoyable efforts are paying off. It is wonderful to share your life events. Thanks. Thank you, Rick. It’s an incredible life!! Fantastic news! Congratulations. We will enjoy reading your column. We’ve got some really cool places lined up for our Jan, March and May columns. I hope you enjoy them!! You two continue to amaze us, but then, you both are very talented, gregarious, and sharing with your readers! May not buy into Trailer Life, just for your outstanding articles, but will certainly follow you both down the RV Road to Adventure. So, keep em coming M&M, good health to you both! Thank you, Glen and Bette. We love learning new things and seeing new places, and being gregarious makes all the difference, even though we are both avowed introverts! Well deserved!! Congratulations!!! The readers are in for a real treat!!! Great news…Congratulations! I’m looking forward to reading the articles!